The Georgia Urban Ag. Council conducted their twenty-fifth consecutive survey of sod producers. The purpose of the survey was to determine the status of inventory levels and projected price changes for spring 2019. Seventeen producers participated in the survey, representing farm sizes which were less than 300 acres (9 participants), 300 to 600 acres (3 participants), 601 to 900 acres (2 participants), and more than 900 acres (3 participants). 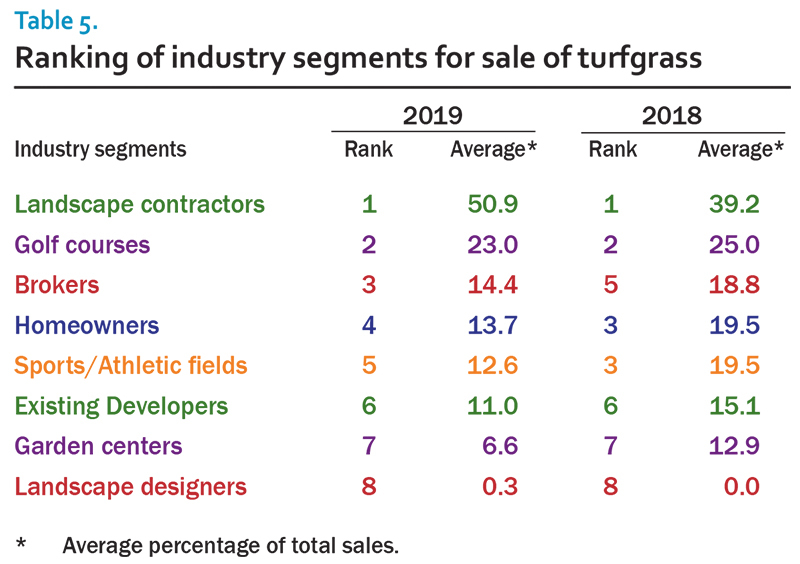 The survey obtained estimates of the inventory for bermudagrass, zoysiagrass, centipedegrass, St. Augustinegrass, and tall fescue based on estimated sales for the first five months of 2019 as excellent (more than 10% of demand), adequate (equal to demand), and poor (more than 10% shortage). Pricing information included farm price and price for truckload orders to the Atlanta area or within 100 miles of the farm, all costs were reported as price per square foot of sod. Bermudagrass is being grown by all of the surveyed producers. Eighty-eight percent of the producers rated their inventory as adequate to excellent this year (Figure 1). Eighty percent the growers with greater than 600 acres expect an adequate to excellent bermudagrass supply, while 92% of producers with 600 acres or less project having sufficient inventories. For early 2019, bermudagrass supply should meet market demand. According to this year’s survey, the number of producers growing zoysiagrass (76%) was similar to previous years. Zoysiagrass is a popular species with many commercially available cultivars. There are at least sixteen zoysiagrass cultivars being grown in Georgia. Of the producers responding, 69% estimate an adequate to excellent inventory, which is lower than last year’s estimate (Figure 2). Of the 17 producers surveyed 10 (59%) were growers of centipedegrass. Eighty percent of the growers had adequate to excellent inventory compared to 75% in 2018, and 60% in 2017. Of the larger growers, 3 of 5 growers with greater than 600 acres expect an excellent to adequate centipedegrass supply. St. Augustinegrass is being grown by 4 of the 17 producers surveyed. Half reported a sufficient supply. Similar to previous years, tall fescue was grown by 47% of producers. Seventy-five percent of tall fescue producers reported excellent to adequate inventory. This is a slight decrease relative to the previous 15 years tall fescue has been surveyed. While it appears tall fescue inventory will likely meet demand, there is a greater potential for limited supply relative to the past. Last summer’s rainy, warm weather increased disease pressure in production fields and compromised inventory. For 2019, the on-the-farm and delivered prices are expected to remain relatively unchanged or decrease compared to 2018 and 2017. Price drops could range from 3% to 7% over last year’s prices (Table 1). Of the five species, only St. Augustinegrass is forecast to have a noticeably higher price than in 2018. 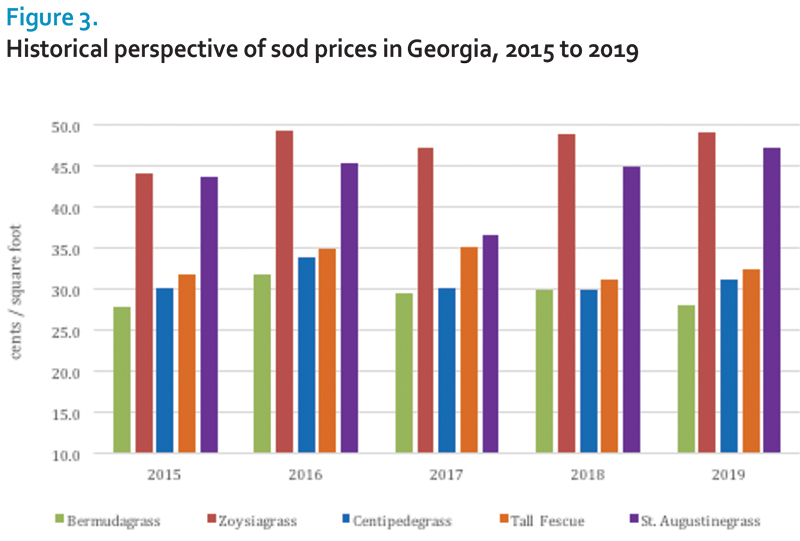 Figure 3 provides a five-year perspective of sod prices. 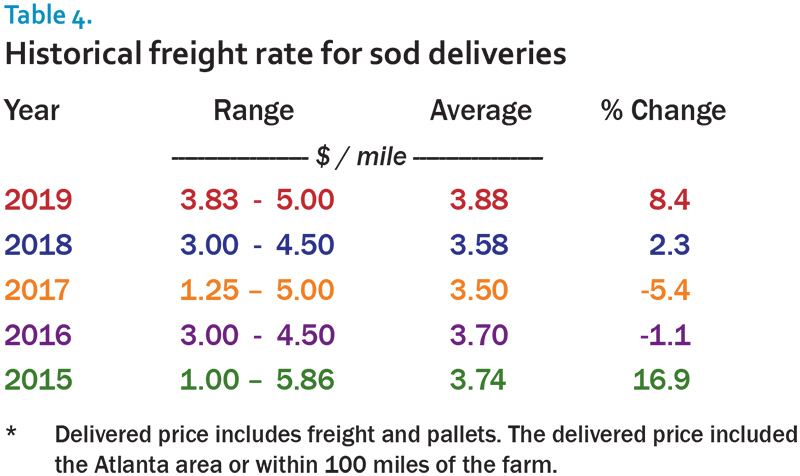 The average price per square foot for a truckload of bermudagrass delivered to the Atlanta area, or within 100 miles of the farm, may be lower relative to last year (Table 1). The 2019 survey indicated prices varied from 21.0 cents to 39.0 cents, with an average price of 28.1 cents (Table 2). The average price in 2018 was 29.9 cents per square foot and ranged from 20.0 cents to 37.0 cents. The 2019 average price for a delivered truckload of zoysiagrass was the same as 2018 levels. 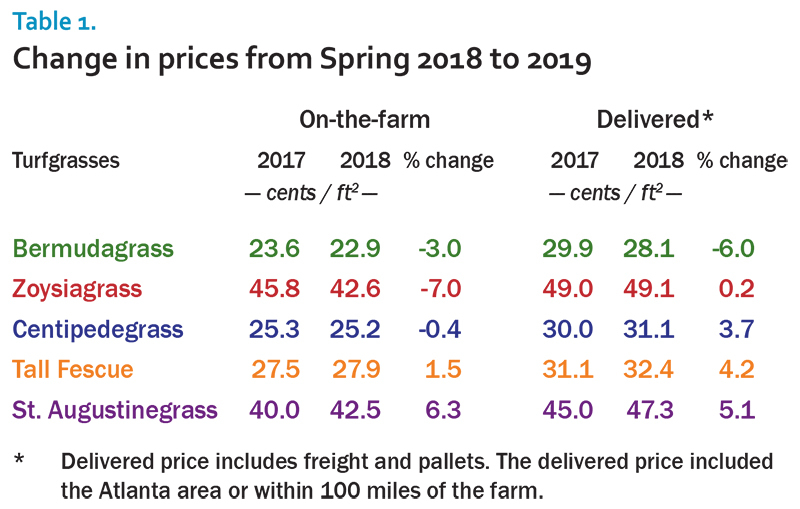 The average price of delivered zoysiagrass in 2019 was 49.1 cents and ranged from 38.0 to 68.0 cents. In 2018 zoysiagrass prices ranged from 36.0 to 60.0 cents and averaged 49.0 cents. Centipedegrass prices are expected to slightly rise this year. Prices in 2019 ranged from 25.0 cents to 38.0 cents and averaged 31.1 cents, compared to 2018 when the average delivered price was 30.0 cents and ranged from 25.0 to 36.0 cents. The 2019 average delivered price for tall fescue (32.4 cents) was 4% higher than last year (31.1 cents). This year, prices ranged from 20.0 cents to 45.0 cents. The price of delivered St. Augustinegrass increased in 2019. 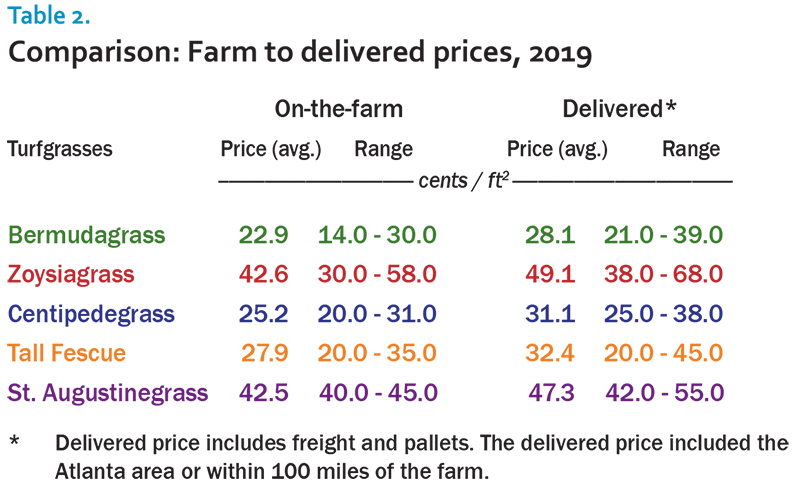 The average price of delivered St. Augustinegrass in 2019 was 47.3 cents. In 2017, St. Augustinegrass prices ranged from 35.0 to 38.0 cents and averaged 36.5 cents. It appears that a 2017 drop in St. Augustinegrass inventory continues to influence prices. Regarding grower price expectations, growers are not forecasting a significant price increase in 2019. 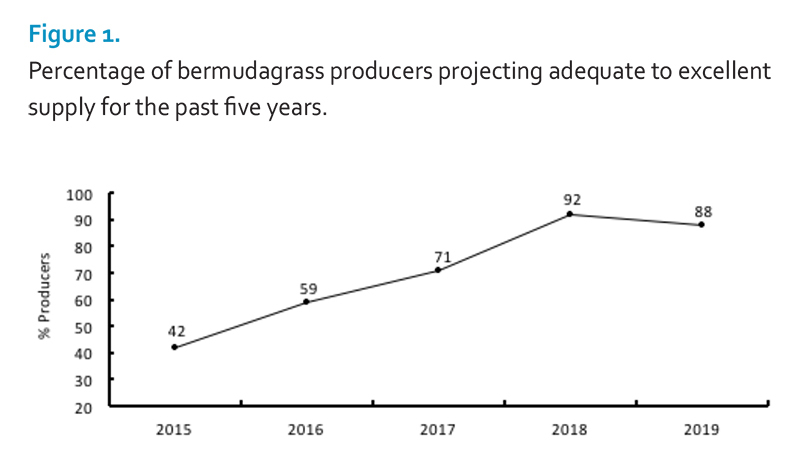 Sixty-five percent of bermudagrass producers expect steady prices while 18% foresee a price decrease during the first five months of 2019. This is a similar to last year and price data from this year’s survey, indicates growers forecast are relatively accurate. 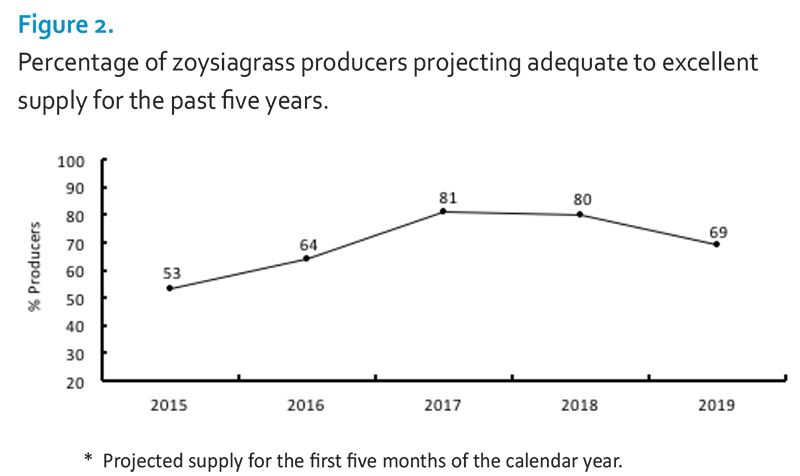 For zoysiagrass, 64% of producers anticipate stable prices during the first five months of 2019; 36% of producers forecast higher prices, one with greater than 900 acres in total production. For centipedegrass and tall fescue, greater than 70% of all producers expect prices to remain constant in 2019. St. Augustinegrass producers expect unchanging prices throughout 2019. 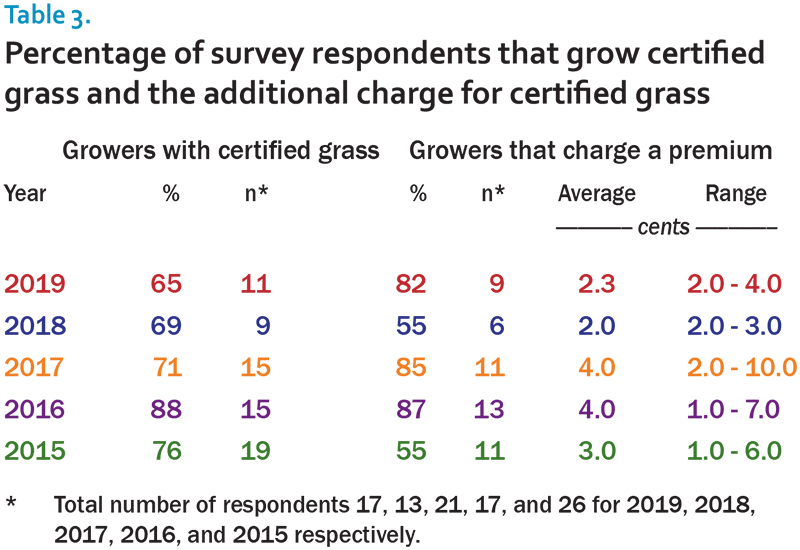 2019 had 11 producers representing 65% of the respondents with some certified grass on their farm (Table 3). Eighty-two percent of these growers charge a premium for certified grass. The remaining growers either do not place an added value on certified sod or do not participate in the certification program. In 2019, the typical extra cost ranged from 2.0 to 4.0 cents per square foot and averaged 2.3 cents. This translates to between $10.00 and $20.00 on a 500 square foot pallet. The price point where consumers (i.e. industry practitioners and homeowners) value varietal purity is unknown. Anecdotal estimates – informal survey of a several hundred participants – of homeowners and end-consumers suggests the value of a certified grass is likely greater than reported in this year’s survey. When told of the benefits of certified sod, end-users indicated they are willing to pay more (e.g. $20 to $25 / 500 square foot pallet) to ensure varietal purity. Freight rates per mile shipped to Atlanta, or within 100 miles of the farm, rose in 2019 (Table 4). Costs ranged from $3.83 to $5.00 and averaged $3.88. A separate freight rate is charged by 31% of the respondents, this is half of what was reported for 2018. Three respondents (19%) reported charging an unloading fee in 2019, down from 2018. The minimum unloading fee ($50) was down from 2018 with producers now charging between $50 and $105. Most producers (94%) will make additional drops on a load. The low-end charge was down to $25 in 2019, compared to $35 in 2018. The high-end charge increased from $75 in 2018 to $150 in 2019. The average cost for additional drops in 2019 was $67.86; an increase from last year’s cost of $57.78. Two respondents reported adding a fuel surcharge to a load in 2019, ranging from $0.25 to $1.00 per mile. 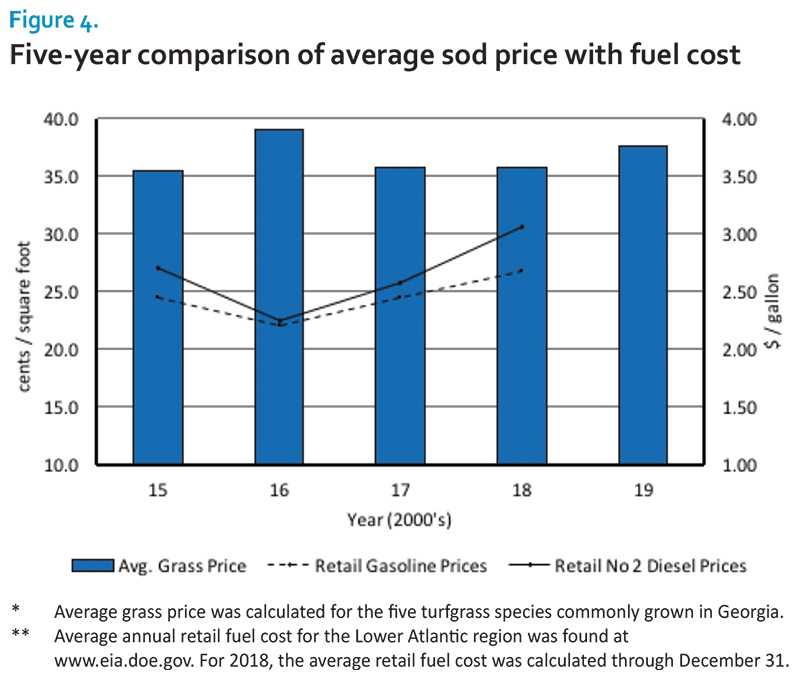 Figure 4 compares the average sod price for all species grown with the average annual retail price for gasoline and diesel fuel. Over the last two years average sod prices have a slightly upward trend, while fuel prices have increased at a greater rate. The 17 producers that participated in this survey estimated that half the grass sold was to landscape contractors (Table 5). This industry segment continues to be the perennial leader. In 2019, golf courses remained in the second position. Brokers have a 2-year trend of increasing in rank from the previous year. In 2018, only one producer indicated they planned to add acres into production. This year, seven producers indicate they may increase their production. The cumulative total increase is approximately 500 acres. Comparing the responses from this survey with the UGA Agribusiness and Economic Development 2017 Farm Gate Value Report (http://www.caes.uga.edu/content/caes-subsite/caed/publications/farm-gate.html), the increases in production are in close agreement. For 2019, the estimated population of Georgia is nearly 10.6 million people (http://worldpopulationreview.com/states/georgia-population/) and the updated population projections from www.GeorgiaWatePlanning.org estimates our population to reach 12.2 million people by 2030. That is a 15 percent increase in our population over the next eleven years. This presents opportunities and challenges for the green industry. While some of these new residents will choose to live in multifamily buildings and not have a lawn. They will still have a desire for grassed areas in green spaces, golf courses, athletic fields, dog parks, etc. Many of these new residents will live in single-family homes with lawns. Indicators are that greater sod volume will be necessary over the next decade. 2019 will be a third consecutive year of steady sod prices. Similarly, inventory for all warm-season species is expected to meet market demand during the first part of 2019. Fuel prices are rising; which could put pressure on costs of production and delivery, altering the expectation of consistent sod prices throughout 2019.